View More In Bluetooth Car Kits. Built-in Noise Isolator Tech helps decrease the buzzing noise some cars make while playing music, thus giving you the best music experience. The magnetic mounting base on the back of Mpow receiver allows you to locate the car kit in a suitable location easily. Experience Bluetooth 4.1 audio with improved connection stability, faster pairing, and reduced power consumption for connected devices when streaming audio. Mpow Bluetooth receiver is lightweight enough to carry around and convenient to place at anywhere on your dashboard, perfectly complements your car's interior. Navigation instruction can be sent from phone to car stereo via Mpow Bluetooth car kits for worriless driving. Works with almost Bluetooth devices and cars with a 3.5mm input. Stream audio through 3.5mm input in car stereo and enjoy your favorite music from phone/tablet/MP3. 1. Fix Mpow receiver on the best position of the car. 2. Plug the USB cable to your car charger to get power. 3. Plug the 3.5mm audio cable to the audio port of the car. 4. Pair Mpow to your smart device. 5. Adjust the car radio to Aux in mode. 6. Now you can enjoy your music and make phone calls freely. 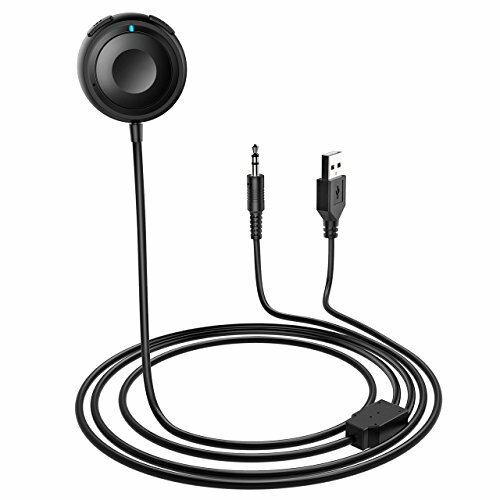 ENJOY WIRELESS MUSIC: Mpow Bluetooth receiver turns your car audio systems, wired headphones, non-Bluetooth old home speakers into Bluetooth-enabled devices let you enjoy high quality music from phone/tablet/MP3 or stream audio through 3.5mm input in car stereo including music, GPS voice navigation, and podcast. BUILT-IN NOISE ISOLATOR TECH: Mpow noise isolator is built into cable, needless of connecting other audio switching cables to guarantee premium sound both in playing music and answering phone calls. Moreover, it features over-current protection and brings full duplex sound quality. DUAL-CONNECTION: Mpow Bluetooth car kit makes it possible for you to connect two Bluetooth devices simultaneously so that you could switch the music between two phones casually or enjoy music without missing your phone calls. AUTO-ON/OFF & RE-CONNECTION: Mpow audio receiver will power on automatically when you start the car, then it will connect the last paired smart devices. (Note: Please make sure the Bluetooth of your phone is turned on before starting the car). ONE-KEY OPERATION & BUILT-IN MIC FOR SAFER DRIVERING: Comes with special one-key design, through which you can answer/reject/hang up/ redial and voice dialing(if available) phone calls. There is no need to worry about distraction brought by looking for various buttons and the built-in Mic allows you to make hands-free calls easily while driving. If you have any questions about this product by Mpow, contact us by completing and submitting the form below. If you are looking for a specif part number, please include it with your message.